Former England captain Geoffrey Boycott has described England's performance in the 72-run Test defeat by Pakistan as one of the worst he has ever witnessed. Andrew Strauss's side were bundled out for 72 on the fourth day in Abu Dhabi as Pakistan clinched the series. Boycott told Test Match Special: "I've seen some poor performances in 25 years of playing and 23 years of commentating and that's as bad as I've seen. "What a load of rubbish. You have to see it to believe it how poor it was." Set 145 to win the Test and level the series, England's batsmen found their technique horribly exposed by the hosts' trio of spinners. 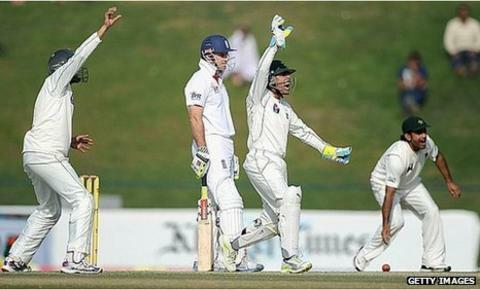 Only Strauss and Matt Prior made double figures, while left-armer Abdur Rehman took 6-25. It was a display that made a mockery of England's position at the top of the Test rankings and showed just how much work they have to do to become a force on slow, turning pitches. Boycott, who scored 8,114 runs in 108 England Tests, added: "They've got enough backroom staff being paid a fortune, they're the number one side in the world, but have never won on the sub-continent and on this performance never will." Since their series victory in Sri Lanka in 2001, England have beaten only Bangladesh in Asia, being held or defeated in seven other Test series while winning just one match. They were also knocked out of the World Cup in India last year after suffering defeats to Ireland and Bangladesh and a 10-wicket mauling by Sri Lanka in the quarter-finals. "This England team has a problem against spin," said former England captain and TMS summariser Michael Vaughan. "They lost to Ireland and Bangladesh in the World Cup - and [Ian] Bell, [Eoin] Morgan, [Kevin] Pietersen and Strauss clearly have problems batting against spinners. Rehman bowled lovely, but there were no balls spitting. "[Jonathan] Trott and [Alastair] Cook played OK and [Matt] Prior played OK at times but clearly the others have a problem mentally. "There are two things wrong: technique - a little bit all at sea playing spin - but mentally as well." Vaughan suggested Bell, in particular, had to go back to the drawing board to find a method that works against the turning ball. "Muttiah Muraliltharan had Ian Bell on toast. Shane Warne had him on toast. And now [Saeed] Ajmal has him on toast," he said. "Orthodox spin bowlers he plays well - but against top-class spinners he's struggling. This will hurt Andrew Strauss - the last series he lost as a skipper was in the West Indies after that 51 all out in Jamaica [in 2009]. The openers set the tone, but they sent out a negative mentality to the rest of the team." England had appeared to be in such a dominant position towards the end of day three that Boycott had quipped in commentary that he would sell his three houses if the tourists lost the match. Afterwards he said: "I have lost all my houses, you stupid England team. I'm kidding but this was a terrible performance." Listen to the Test Match Special podcast.